RIDE a Part of Cycling History! 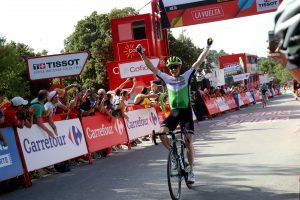 The 2nd week of La Vuelta looks like where this year's race will be decided, on the big summits of Northern Spain! Get your climbing legs ready as we are going to take you to the famous climbs and ride the stages where new legends will be born. With VIP access at the finish lines and some beautiful roads to pedal across the traditional home of cycling in the Basque Country, Cantabria and Asturias, this tour encompasses everything La Vuelta stands for: passion, emotion and a great spectacle! 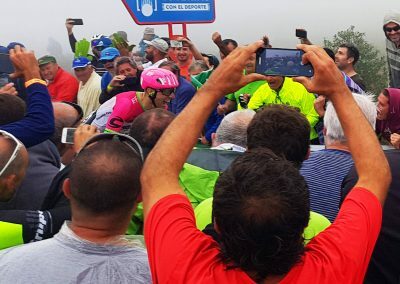 La Vuelta can never stay away from the mountains, and this year we have the feared hors category beasts of the Machucos and Acebo to conquer, plus the cat 1 summits of the Coberteria and Cubilla with spectacular views. We decided to cut down the drive time in the vans and forgo visiting the one other mountain stage in Andorra to spend more time on the bikes. So from Bilbao to Oviedo (and transfer back to Madrid if required) we will follow the 7 days that has the real meat of La Vuelta sandwich. It's time to dance on those pedals, as we offer you all the support and encouragement you need to hit the highs. These will be the stages to change everything for the podium in Madrid. We anticipate great things and you could be there! Arrive and meet in our centrally located hotel in Bilbao at 12.30 midday (transfers offered from Bilbao airport that morning). Enjoy a welcome drink and meet the crew and the other guests before setting up the bikes and heading out on a warm up ride. This is a great region for ciclismo and the Pais Vasco cycling fans are known for their great passion for the sport. Today we will take a leg spinner out from the hotel to get used to the bikes and cycling the roads of Spain. We will head to a bar after the ride and catch up with the all day's events at te race on the television. Spend the next two nights at our 4 star hotel with a stylish twist. Tonight enjoy a welcome dinner together with some modern takes on traditional Spanish favourites. After a filling buffet breakfast, we transfer out to hit the race route. Sample your first day of riding La Vuelta roads in the middle of the Basque Country. Beautiful scenery everywhere, we pedal back towards Bilbao through a protected parkland on a rolling route that serves up three category 3 climbs in a row! You will have the options to ride what you prefer on this route, as you all descend the last summit to the finishing line. With the passion of the "orange tide" of Basque fans, the atmosphere is always fantastic. 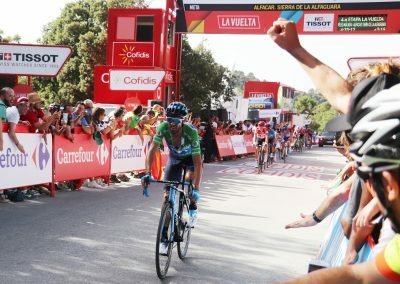 This is a great first stage for us to feel the thrill of La Vuelta. 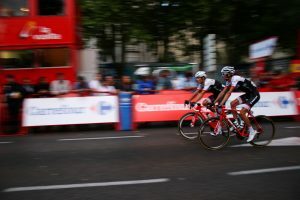 Ride across the finish line with our special access and then enjoy the VIP viewing area and hospitality at the finish as we watch the pros finish on the same route we just cycled. After the excitement of the race, we take the very short transfer back to our Bilbao hotel. Have time to explore the restaurants and bars of the area or head into the old town. 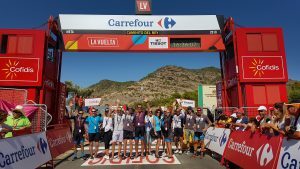 To explain, the VIP Hospitality Area – This is an exclusive part of our La Vuelta tour packages, where each of our cyclists have access to the VIP zone, with a personalized accreditation given on a lanyard at the start of our tour. Here, just meters from the Meta Finish line, see the riders finish the race, preview the stats, and watch the ongoing race before hand via large plasma TVs in the area before it arrives! Also included is an open bar and tapas tasters for a real Spanish experience. Well, here is a great day of riding....for the climbers! We pick up the race route and are soon out climbing the ever so beautiful 8 km category 2 climb of the Puerto de Alisas, a pass often featured in past Vueltas. With views from the top across the green mountains, we descend down to the valley before riding over the next two cat 3 climbs. In La Vuelta, you have to remember that distance is the not the key, but the vertical climbing! And so we face our big challenge of the day - Los Machucos. The twisting forest trail (cow track!) 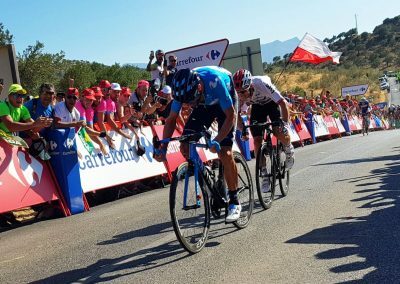 up to the exposed rocky high alpine fields with its Hors Category (especial in Spanish) finish is a real monster and the crowds will cheer you up as you suffer up it. With a few short ramps at 24%, we will somehow ascend. Don't worry, the Pros will be in pain too! 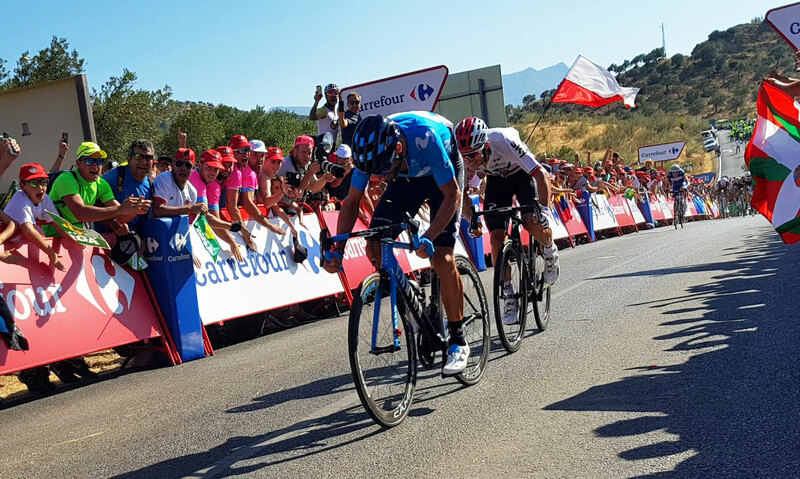 It was last used in 2017, and will be remembered as the day Froome lost some time to Contador and Nibali. It will be a tremendous atmosphere up at the top! It will be one you remember for sure and make the finale a memorable experience to watch in the VIP zone. After the podium celebrations, we make our way down this immense climb and transfer to our luxury Parador escape in what is constantly voted as one of Spain’s pettiest villages, Santillana del Mar. A phenomenal collection of perfectly preserved medieval buildings and we are staying right in the middle of them! It makes for a perfect start for tomorrow’s stage. After a long day, a group dinner is included in the very well regarded Parador restaurant. We will all sleep well tonight. A more relaxed day is planned today after the last two mountain stages. After a fine buffet breakfast at our Parador retreat, we will ride from the hotel along the northern coast of Spain to the stage 14 depart in San Vicente de la Barquera. This fishing village is a firm favourite for La Vuelta to depart from, with its jaunty sea air atmosphere. 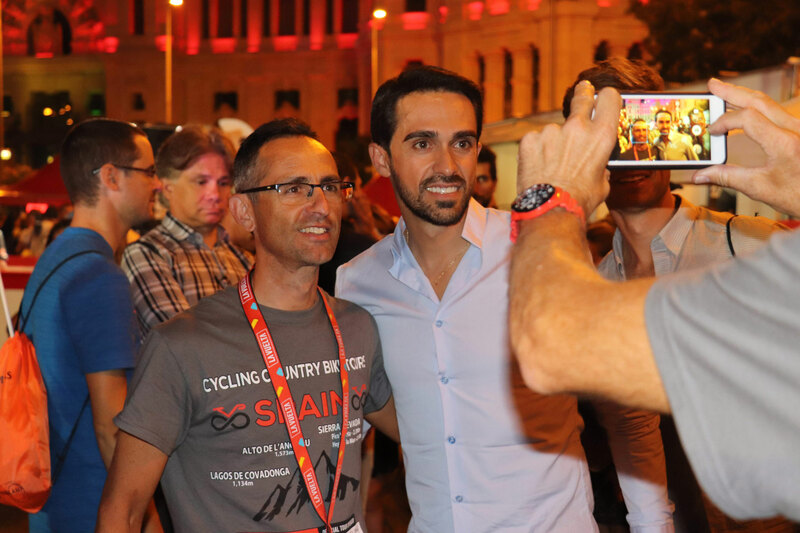 With our VIP passes, spend time in the Vuelta Depart village, enjoy the buzz of the team buses arriving and walk around taking photos (selfies?!) 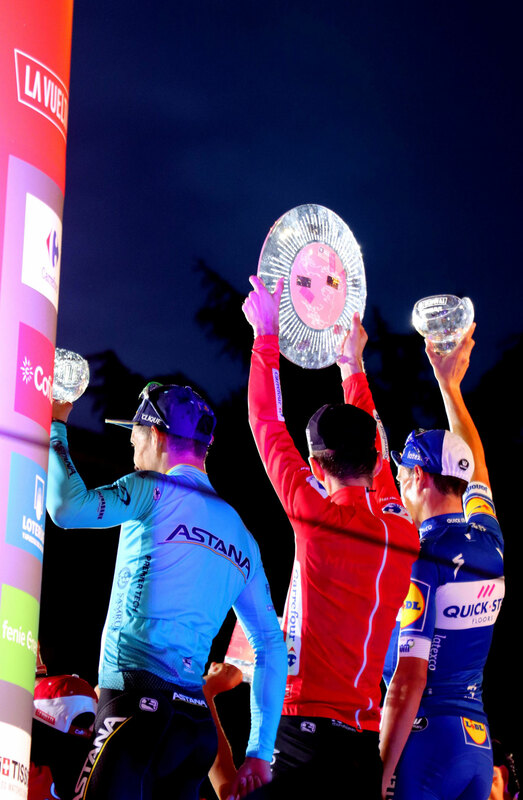 of the stars of cycling. After we see the peloton and the Vuelta entourage leave, we continue riding along the coast with views of the sea to our right and the mighty mountains of the Picos de Europa to our left. We are now behind the race on the route. Heading off we ride along some of the famous Camino de Santiago, the Way of St James' Northern Route, stopping in a beach town. After this flatter route, see the stage finish (expected sprint finish being a flat stage) on television and then hop in the van to take a transfer our pro team hotel in the attractive city of Oviedo, our base for the next 3 nights. Tonight, we have a special treat lined up as we take a drink and have a chat with an ex-professional rider to learn about riding a Grand Tour. 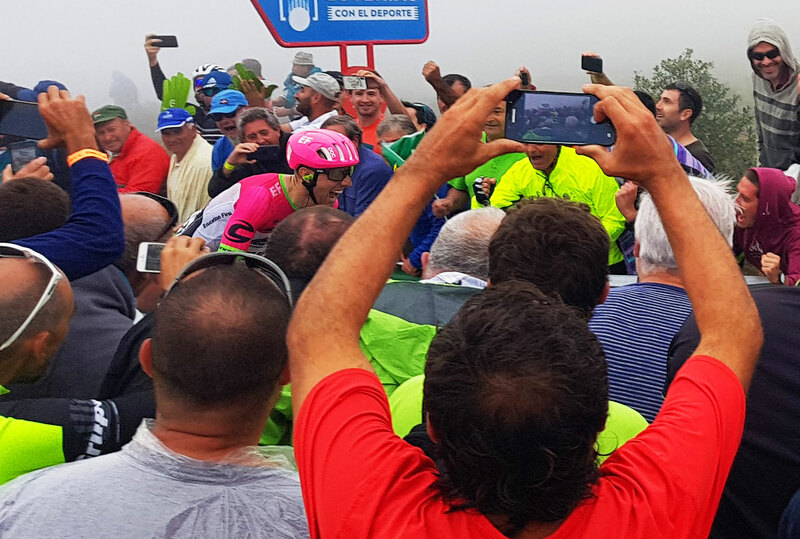 To Explain – The Vuelta Depart Village is an added perk of our VIP hospitality package. 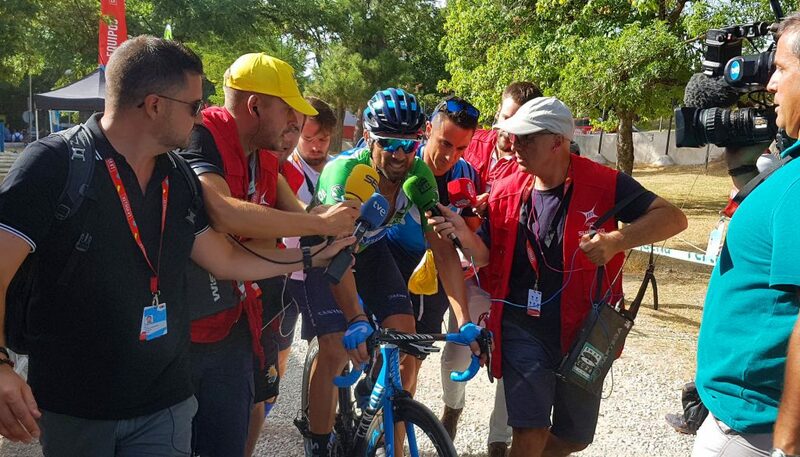 Each day the teams must sign on to start the day in a presentation, but prior this, the riders are warming up, giving interviews, signing autographs and prepping their bikes. As well with our VIP passes, we have access to an area of local businesses and patrons who have stands where we can get nibbles, drinks and gifts and enjoy the friendly atmosphere. We hit the race route which has an incredible cat 2, then two cat 1s and then an Hors Category mountain to finish. Being mere mortals we will concentrate on riding out and then hitting the last 2 huge climbs. The cat 1 pass of el Pozo de las Mujeres Muertes (or well of the dead women!) is 11km long with an avg gradient of 6%, a nice warm up for the final climb. Never before used in La Vuelta, we will have a go at the inaugural Puerto de Acebo, an Hors Category climb (Especial in Spanish) of 9km. Less than the one before, but steeper with an average gradient of 10% (gulp!). Today, we have decided to watch the race roadside from this final mountain and see the leaders fight it. 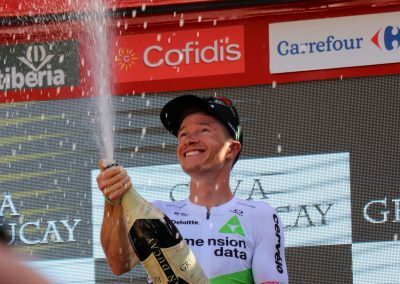 Anyone who wants to win La Vuelta will have to stay in contention today. The atmosphere will be electric, being a Sunday, with the Asturiano crowds out in force. Descend back down the mountain after the race, before taking a transfer back to our hotel in Oviedo. Enjoy a night out in what Woody Allen once described as his favourite European city. 95+ km / 60+ miles Tired legs will be present for us all as we embark on another phenomenal day of vistas in a gorgeous area we, and La Vuelta, love to cycle. It is an important day as there will be much jostling and vying for that top dog position before tomorrow's rest day as the route has 5 categorised climbs with the final three being cat 1s! We plan to ride this rollercoaster as well, again focusing on the last half of the stage. Riding up the valley we will summit the first climb of Cobertoria, a stunning and snaking pass that is often featured. After recovering on the descent into Pola, it is time for the extremely long (26km) summit finish up the Cubilla - sounds scary but with an avg gradient of 6%, it is very rideable! Also known as one of the most beautiful climbs in Asturias, the scenery will take your mind off the endless up! For this key stage, we have VIP stage finish access, after you have crossed the line. What a way to finish, as we see the pros literally fly up this mountain. 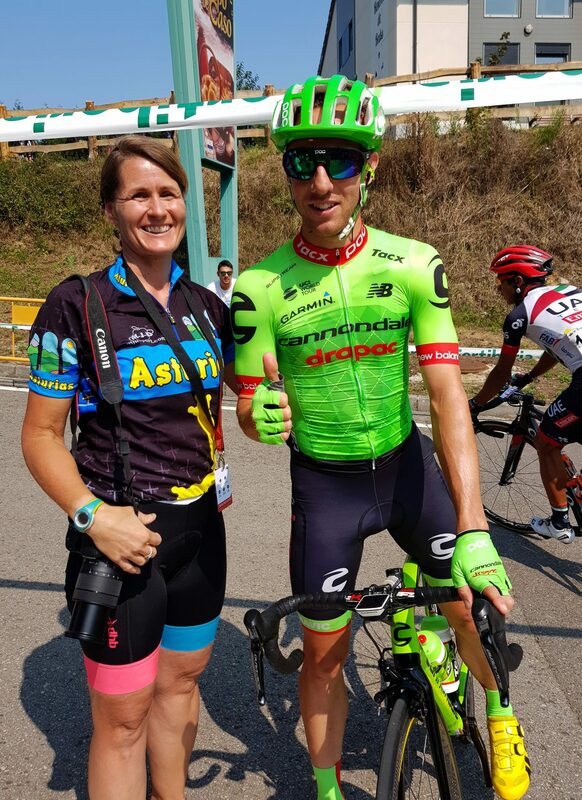 Today we will also have access to the podium for your photos and an insider's tour behind the scenes of La Vuelta. Learn about the doping controls, the media area and how the stage is set up. 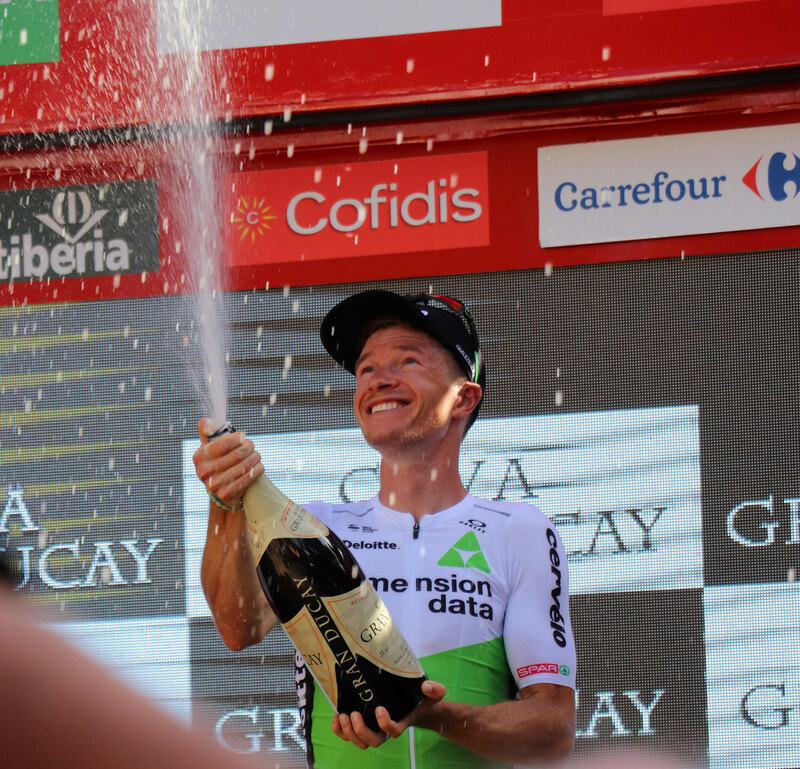 A very special way to end your very own Vuelta tour. We take a transfer back to Oviedo and enjoy a farewell group dinner together. 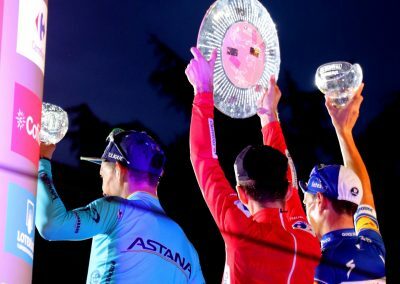 Today, we should have a clearer view on who will win this year's tour. Day 7. Tuesday 10 September - Onwards Travels or Continue onto Last Week Tour to Madrid! In the morning, after a final buffet breakfast it is time to say hasta luego as we depart for our onwards journeys (onward transfer to Madrid included if required). However, there is no need for a farewell (you willl not want to leave! ), as choose to stay longer and carry on for the final week to Madrid with us. Add on the all important final week tour to this Middle week and buy the Combined Jersey Package (a 10% discount on the two tours, including transfers in between). 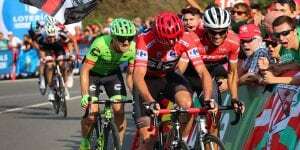 A real Spanish Vuelta Fiesta! Challenging - distances are a daily average of 100km. Please note this is hilly countryside with some longer and steeper climbs. It is classed as Challenging as there are some tough climbs. We offer van support so it is possible to opt out of some of the harder ascents. VIP access to stage finishes / depart villages. This includes a private race viewing area at the finish with complimentary drinks and tapas. We will also have access to the podium for your own photos, access to back stage areas. 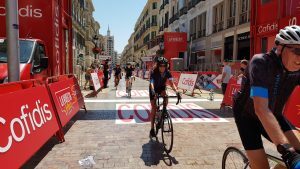 We work with La Vuelta organisers to make your experience unique. 3 to 5 leaders with full van support to pick up souvenirs, provide refreshments, act as guides, offer tips and insights throughout the day, provide directional signs where required, transfer luggage and provide on-road assistance. 1 or 2 guides cycle with the group. Wheelset upgrades to Ultegra or Dura Ace wheels offered, given availability - please ask. If you do bring your own bike, we recommend a triple or compact chainset. Transfer to Oviedo Airport at end. However we do include a transfer back to central Madrid from Oviedo (5 hours) and / or onto the Final Week Tour. Add on the all important final week tour to this Middle week and buy the Combined Jersey Package (a 10% discount on the two tours, including transfers in between). 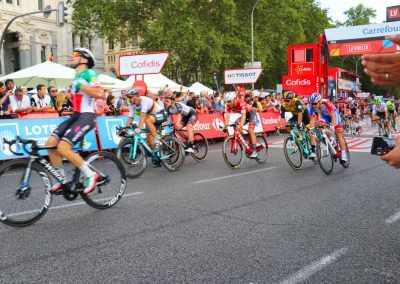 A real Spanish Vuelta Fiesta! Just because you are on a bike trip doesn´t mean you have to suffer off the bikes too! We take this into mind on our Vuelta Bike Tour and have lined up some pretty impressive hotels for these tours. Many are historical monuments or at least close to city centres or main tourist attractions to make the most of your time in this most interesting country! While the Pros are making history on the Tour, we can enjoy Spain's history on our off hours too. 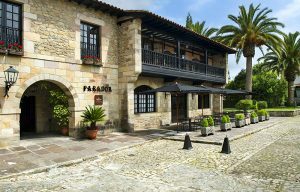 Surrounded by an amazing array of medieval buildings this attractive Parador fits right in. In the centre of history, you can wander these cobbled lanes to your desire and get a full nights slumber here. It is a special place to stay the night. 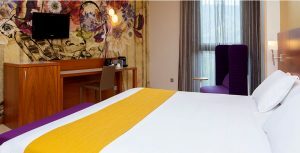 A modern 4 star city centre hotel that is close to all amenities and keep your night time slumber, tranquil and restful. Enjoy its restaurant which serves modern takes on old favourites and a wonderful buffet breakfast to get you started on those mountain rides! 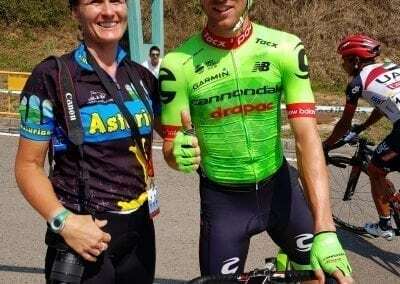 "We returned to Andalucia for the 2018 La Vuelta having enjoyed the la Vuelta 2017 tour so much with Cycling Country. We expected to repeat that enjoyment and we were not disappointed. Great riding, great viewing, the best of hotels and food and an interesting and challenging group of cyclists. Geoff and Maggi, our hosts, dedicated themselves 100% to our pleasure and comfort and were ably assisted by the two bike guides, Dean and Javi. All participants have their own priorities. 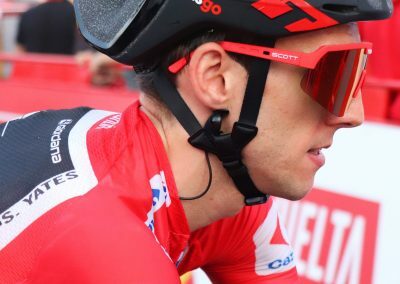 For some their own cycling, for others watching the professionals really close up and intimate. For us it was a combination of those two, plus staying in such lovely hotels, you couldn't find better, where we rubbed shoulders with the teams from Trek, Sky and Bahrain. From the modern sophistication of our 4 star hotel in Malaga and the 5 star hotel in Granada to the stunning beauty of the Parador hotels in Ronda and Nerja. The riding was hard and hot and, for the most part, great fun. Anyone who says the last km of the 2540m Sierra Nevada climb is 'fun' doesn't inhabit the same planet. Nice climbs and even more spectacular descents, particularly the Puerto de Leon. We look forward to next year's tour with anticipation knowing that whatever the route, whatever the composition and size of the group, we will have fun." 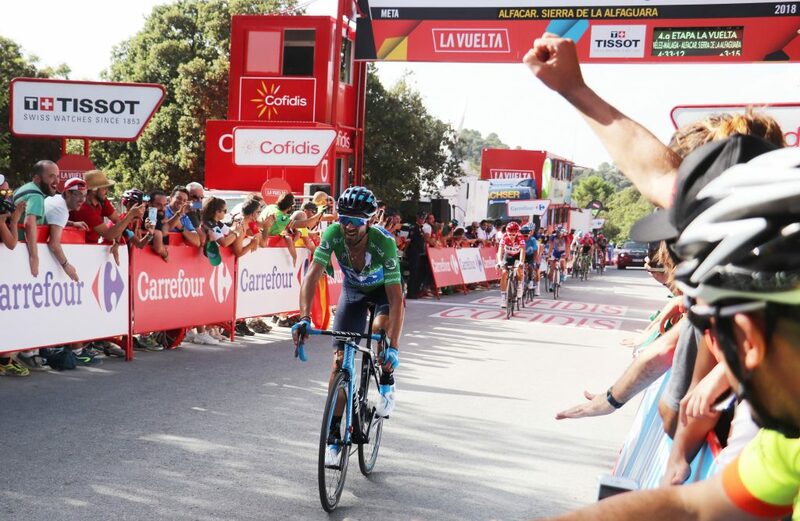 "La Vuelta's epic climbs - a truly spectacular and special cycling week with Cycling Country. Even in a country blessed with great places to ride, Andalusia stands out as a truly spectacular region. 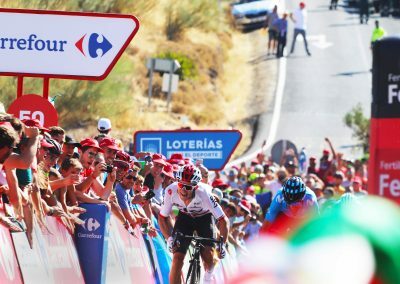 La Vuelta offers climbs that legends are made of. 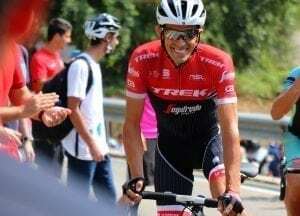 It offers beauty, brutality, drama and this year a piece of cycling history with Contador's Angliru ending I would like to thank Cycling Country (CC) for the enthusiasm and vision in creating an outstanding week, and for their impeccable support with logistics. 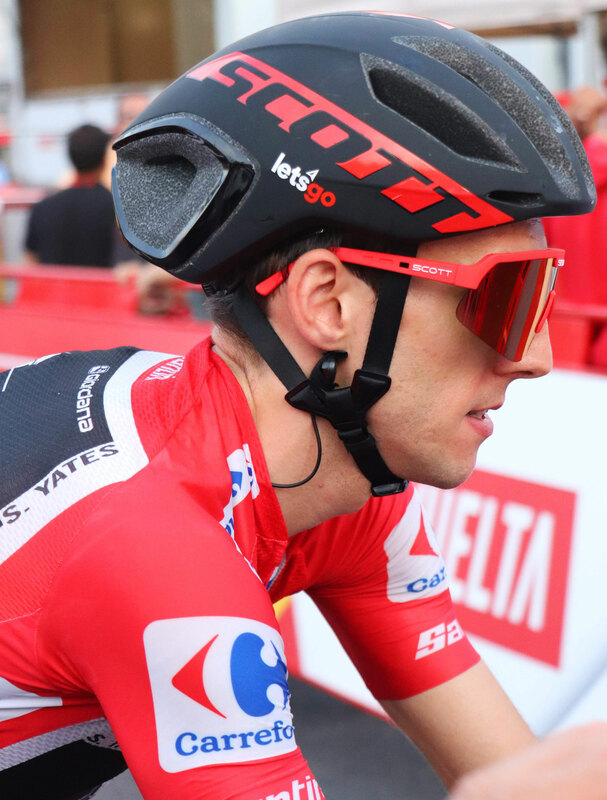 I love the accessibility and closeness CC provides to La Vuelta. You are never too far away from the pros. 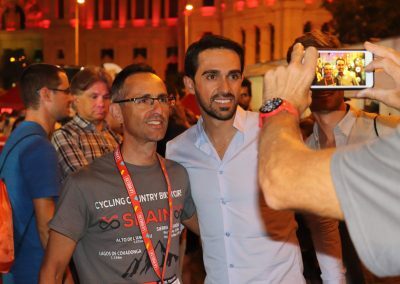 Meeting Fernanco Escartin, a former Spanish road racing cyclist, now responsible for route design and road selection, provided enormous insight in the running of La Vuelta. 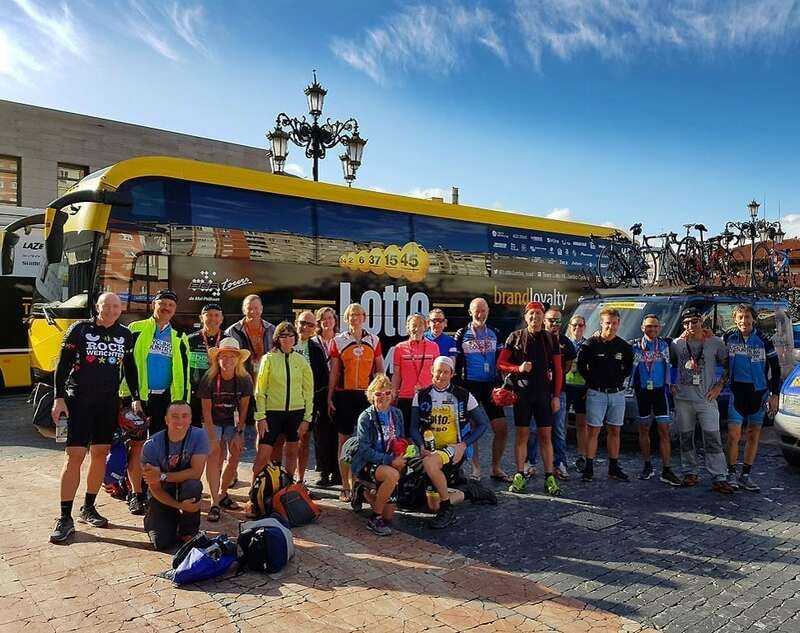 Having the group stay in the same hotels as the professional teams provided the opportunity to meet mechanics, support people and also the professionals. 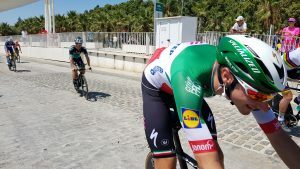 As an Italian supporting Vincenzo Nibali I was excited to know I was staying in the same hotel as the Bahrain-Merida team. Although following La Vuelta so closely I still managed to go out and enjoy the local custom. In Almeria I went really local by having a couple of drinks at Cafe Bar Nevada and dined at Cafe Puga. I think I was the only non-Spanish so you could not have found a more local place. I found similar places in Granada. Additionally the delightful place we stayed at in Zuheros was special - probably one of prettiest villages and scenery in Andalusia.The cycling was superb. 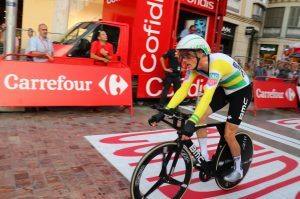 Given that the whole area can become swamped by cyclists during the Vuelta I thought CC did a fantastic job to keep everyone on target. It is clear that this is a family run business with great knowledge of the area. The guides are all local and provide enormous support and valuable insight. A true pleasure to be able to spend time with them. Geoff and Maggie, the owners, should be immensely proud for how they contribute to La Vuelta and how they run CC. 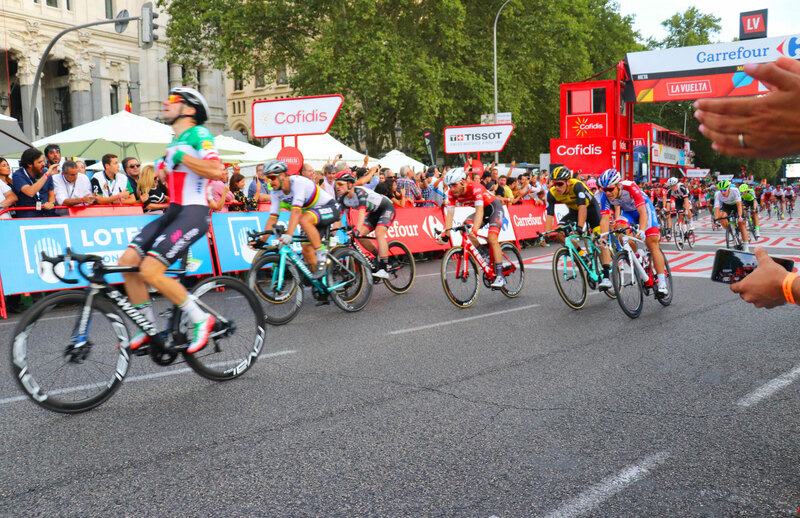 Their tours contribute towards establishing the Vuelta as one of the most dramatic tours. Hasta Luego!!!" 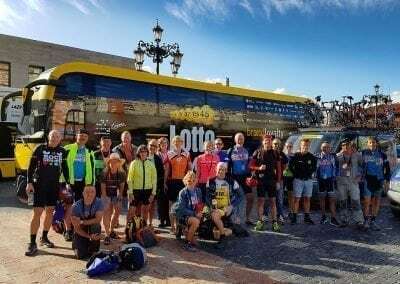 "With Cycling Country we made our first cycling trip to Europe. Geoff, Dean, Javi and the rest of the crew made our rides and say really happy. Balbino took care of my mom and showed her Spain while me and my brothers went riding, then we met at the finish line of La Vuelta stages. It was a terrific Trip and we will for sure do it again!!!" "Let me write a few lines of thank you. I just can't believe what a trip you gave us all! It was truly a cycling tour that I will never forget. Well done to all of the Cycling Country crew and thank you again for the good times. 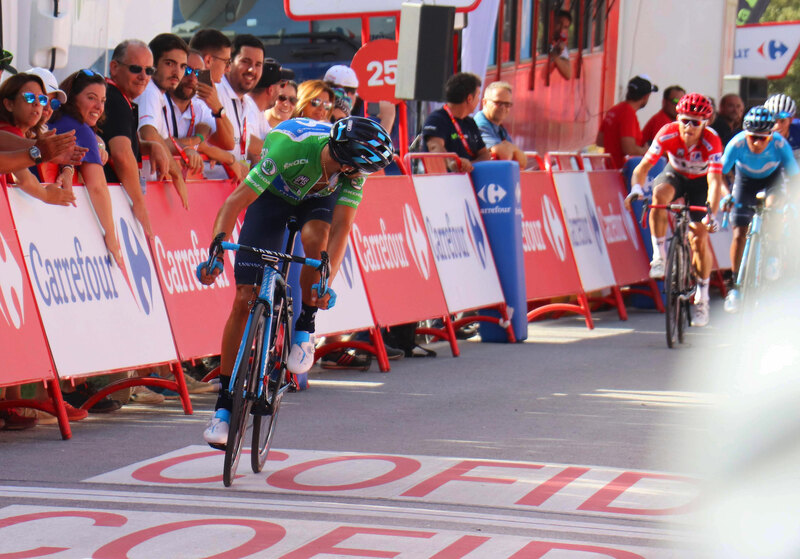 The Vuelta was the ride of my life." 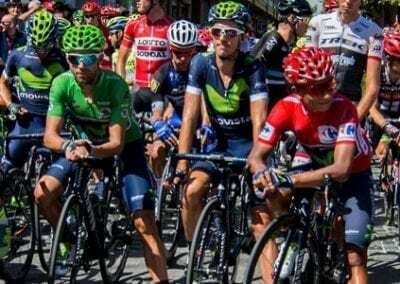 "The Vuelta Tour 1 (Andalucia 2014) was memorable! The VIP access was exceptional, beyond my expectations. Cycling Country beautifully handled different levels of cycling abilities in the group in the smoothest way, the coordination among them was very professional and efficient, providing to the group an ongoing feeling of safety, support and fun. I will highly recommend them to all my friends and they honestly deserve to run such a successful business. Muchas Gracias for the extraordinary experience! " "Rob and I would like to take the opportunity to send you a big thank you for everything you organized for the tour. We had an amazing time. The ride routes where spectacular and the VIP access was fantastic. Dean and Javi were both lovely, very helpful and encouraging. We had the best time and keep reminiscing about the week wishing we were still in Andalusia. It definitely exceeded all our expectations and hopefully will see you at next years tour. Thank you again"
Testimonials from previous cyclists are always available and we enjoy receiving the feedback after tours. It helps us improve our services and offer you an even better experience. Please feel free to contact us if you would like a reference to talk to. 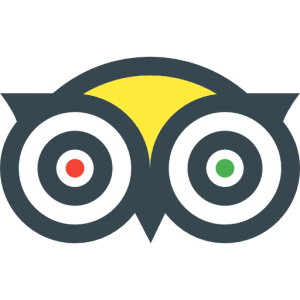 Others have also posted reviews on the independent travel website . 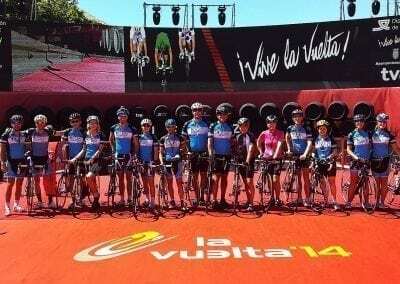 Fully supported riding by experienced guides, including Vuelta a Espana masters rider and mix of male / female guides.